Go to any tennis club the world over and observe people playing. Before long, you’ll see rackets thrown to the ground and screams of frustration and self-criticism at missed shots. Tennis anger is common, and all tennis players experience it to some extent. Even if we don’t lose our temper, or show outward signs of anger on court, we often get angry inside. But as I wrote in my last post about John McEnroe, anger can limit our ability to play to our potential and can seriously dent our tennis confidence. Before we can overcome anger, we need to become skilled at noticing when anger arises. Most of the time we’re on automatic pilot, and we experience our thoughts and emotions in a kind of foggy blur. To get out of autopilot, the next 3 times you play tennis, commit to the intention of noticing anger. When you realise you’re angry on court, acknowledge it by saying silently to yourself, ‘there’s anger’. Then take a few moments, before playing on. Remember, there’s nothing wrong with anger. It’s a normal human emotion, and we don’t have to get rid of it. If we try to suppress it, it’s likely to re-emerge with more force later. So, when it arises, just let it be there. All you need to do is notice and acknowledge it. You can continue this practice off the court at any other times when you feel anger arising (for instance, at work or at home). Practicing off the court will help you notice anger more effectively on the court. 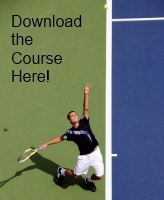 Once you’ve practiced this step over 3 consecutive tennis sessions, move on to Step 2. Now, whenever you play tennis, after doing Step 1 (noticing and acknowledging anger), redirect your attention to your breathing for 3 breaths. You can tune in to your breathing in your nostrils, in your belly or in your chest, or anywhere where your breathing is vivid to you. After the third breath, simply continue playing. b) Acknowledge Anger by Saying Silently, ‘There’s Anger’. c) Redirect Your Attention to Your Breathing for 3 Breaths, Before Playing On. Practice Step 2 for a few weeks, and you’ll notice a real difference in how you respond to tennis anger when it arises on court. These 2 Steps can be enhanced by regularly doing mindfulness meditations, which will help you develop your skills of noticing anger and redirecting your attention, as well as improving your on court concentration and ability to play in the zone. This entry was posted in Tennis Anger on December 4, 2011 by admin. No player exemplifies the mental challenges of tennis quite like John McEnroe. His epic outbursts provided colour to many a match, and the infamous ‘You cannot be serious!’ episode at the 1981 Wimbledon has gone down as one of the most iconic moments in sports history. But would McEnroe have been a better player without the tantrums? The great man himself certainly thinks so. He writes in his autobiography, ‘Serious’, that if he had had the ability to remain calm, he would have performed better. Of course, one might say that with 7 Grand Slam titles to his name, McEnroe was already performing to the top of his ability. But after his golden year of 1984 (42-match winning streak + victory at the US Open and Wimbledon), McEnroe never again won a singles Grand Slam. Although he often played well in his later years on tour, he never made it past the semis in any of the Grand Slams, and had difficulty getting to grips with the high power games of younger tennis stars like Boris Becker. In fact, McEnroe is the first to admit that his temper often disrupted his rhythm, and was often an indication that he was about to choke. He sees his anger as a response to nerves and a deep-seated fear of failure. Unlike his rival Jimmy Connors, who diffused tension in matches by joking around, McEnroe expressed tension by losing his temper and lashing out. In ‘Serious’, McEnroe displays great humility by apologising to all those who bore the brunt of his anger. Indeed, McEnroe reveals in his book that he often apologised to players and umpires after matches for his behaviour. McEnroe’s book offers some intriguing insights into both his personal psychological make-up and tennis psychology more generally. Beneath the tough exterior is a sensitive man, with ultra high standards instilled in him by his parents. His drive to succeed is intense, as is his contempt for failure. He describes his 1982 Wimbledon (reaching the final but losing to Jimmy Connors) as a ‘lousy’ tournament. Hovering around 8 or 9 in the world rankings during the last 6 years of his career qualifies as ‘world class mediocrity’. McEnroe judges himself so harshly that it’s hard not to feel sympathy for him. It’s interesting to note that as a child, McEnroe would burst into tears whenever he lost, but never lost his temper. Like Andre Agassi, McEnroe admits he never really enjoyed playing competitive tennis, finding the stress and loneliness of the sport hard to bear. Every match was haunted by the fear of losing, especially at the height of his success when he was expected to win against all but the very best players. Victory brought relief, rather than pleasure. McEnroe had great natural ability and worked hard. This translated into many years at the top of the game and 7 major singles titles. He also spent more time engaging with the thought stream in his head than many other players, and I wonder if, ultimately, this prevented him from reaching his full potential. His famous defeat by Lendl in the 1984 French Open final is a case in point, where a loss of mental composure cost McEnroe the title. How many more Grand Slams might McEnroe have won had his mental game been stronger? Might he have been the Federer of his day if he had been able to disengage from his thinking and focus fully on playing each point? This entry was posted in John McEnroe on November 30, 2011 by admin. Andy Murray deserves his place among the elite top four players in the game, as he recently proved by winning three Asian Swing titles in a row, adding to his two Masters 1000 titles this season. Murray can and does beat anyone. In 2011, he’s beaten Djokovic and Nadal in finals, and remains one of the few players to have a winning record against Federer. Yet unlike his elite rivals, Murray hasn’t come close to winning a Grand Slam. His three major final appearances all ended in straight sets defeat, with the Scot unable to play to his potential on the biggest stages. Likewise, Murray has put in lacklustre performances in crucial Grand Slam semi-finals, notably against Nadal the last two years at Wimbledon, and again at this year’s US Open. So, he’s capable of beating anyone, but can’t do it when it counts the most. Murray’s friend and rival, world number one Novak Djokovic, has said that the only thing standing between Murray and a first Grand Slam win is his mental game. There was no doubting Djokovic’s wisdom after Murray’s defeat against Nadal at Flushing Meadows. Early on in the fourth set, Murray had the edge on Nadal, but when he netted a straightforward backhand and lost his chance to break Rafa in the second game, he slumped never to recover. Murray spent time between points commentating on his own play, vocalising his frustration and trying to talk himself into playing better. A similar situation arose in this year’s Wimbledon semi against Nadal, when Murray, leading by a set, missed a simple forehand, which sent him into irreversible decline and another defeat at the hands of the Spaniard. It’s clear that this negative, self-critical approach doesn’t work for Murray, yet he keeps doing it. What can Murray do to improve his mental game and win big? Learn to disengage from his thinking. At the moment, when the pressure’s on and the stakes are high, Murray gets lost in his thoughts, trying to ‘work things out’ in his head. This approach compounds his problem by increasing cognitive activity (thinking) and thereby making it much harder to play with flow and instinct. In tennis, or any other sport, it’s simply not possible to think your way into the zone. Rather than engaging with the thought stream in his mind, Murray needs to learn to let his thoughts be just as they are, and refocus on the task in hand. A good way to do this is to develop mindfulness skills. By regularly practicing short, daily mindfulness meditations, you can learn how not to get carried away by thoughts, and thereby remain fully focussed on whatever task you are engaged in. If Murray developed such skills it would be much easier for him to let go of the negative thoughts which arise when he misses an easy shot at a crunch moment in a big match. By not engaging with his thoughts, and refocussing his attention on his present-moment experience, Murray could free himself to play to his potential – and there’s no doubt that he has the potential to win one or more Grand Slams. This entry was posted in Andy Murray on November 28, 2011 by admin.